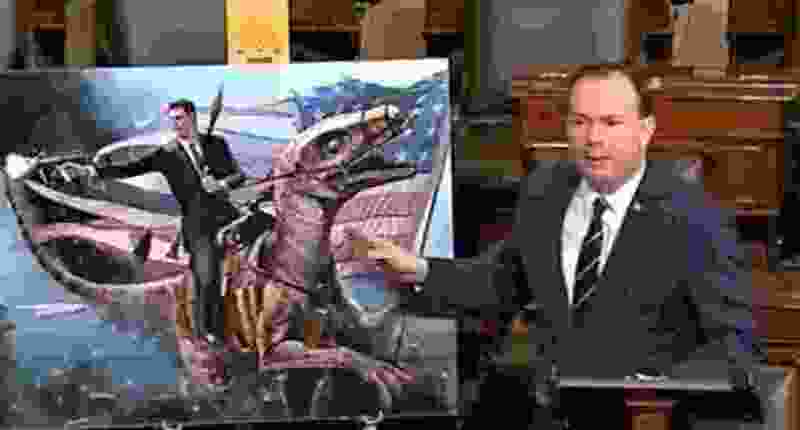 (CSPAN) Sen. Mike Lee uses an image of Ronald Reagan on a velociraptor to denounce the Green New Deal. Ocasio-Cortez also tweeted about Lee's posters, noting they were paid for by taxpayers. “GOP Senators are using their Congressional allowances to print Aquaman posters for themselves to argue that a #GreenNewDeal saving our nation from climate change is a ‘waste of money,'” she said, using an emoji that is laughing so hard, it is crying.